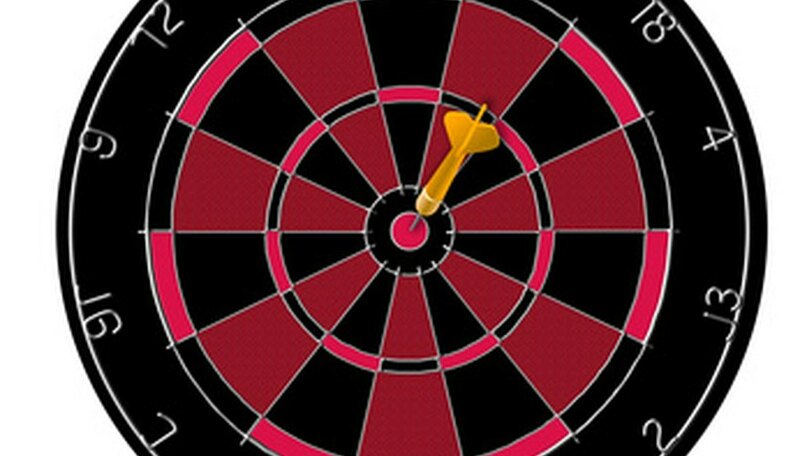 Electronic dart boards give dart players a chance to play a wide variety of games. It helps simplify score keeping by doing it right on the board itself. Regent Halex makes many different types of these electronic dart boards. These dart boards share several of the same games, making any one of them easy to play quickly. This dart game is one of the more popular Halex games as it is one of the simplest to play. It can be played by as many players as you like. Players take turns throwing three darts at the board. Each player starts with 301 points and each successful dart throw subtracts from that score. Players must reach exactly zero. Getting a score higher than their final score returns them to the score they had at the beginning of the round. Double scores are earned by hitting the small rectangles at the end of each score while triple points are earned by hitting the small rectangle in the middle. Double out and double in are game options where players must go out by hitting a double or enter the game by hitting a double, respectively. Variations also include adding more 100 points to the score, such as 401 and even 701. Round the clock is a game that can challenge the skill of any dart thrower. Players must hit each number on the dart board in order. They start with one and then move on to 20. Each player gets three darts per turn. The board will indicate where you must land. Landing correctly moves you on to the next number, with the dart board keeping track of all the players’ progress. There are several different options that can add to the challenge of the game. Players can start at five, 10 or 15 if they would like. Players can also try to hit the double or the triple of every number instead of just the single. Players can also start at the five, 10 and 15 on the double and triple levels. Players don’t score points in any of these variations, they simply try to get to the 20. All fives is a game that challenges dart players math abilities. Players throw three darts reach round in order to get a round score that is divisible by five. For example, if they scored one 10, a six and a nine, their total score would be 25. This is divisible by five. Players earn one point for each successful five earned. Every spot on the board can be counted. Players must land all three darts on the board for their score to count. The Halex board will keep track of the score and the points earned, making the game much easier. Players must earn 51 points in order to win. All variations follow the same basic rules except it adds more points to the win total, such as 81 or 91.